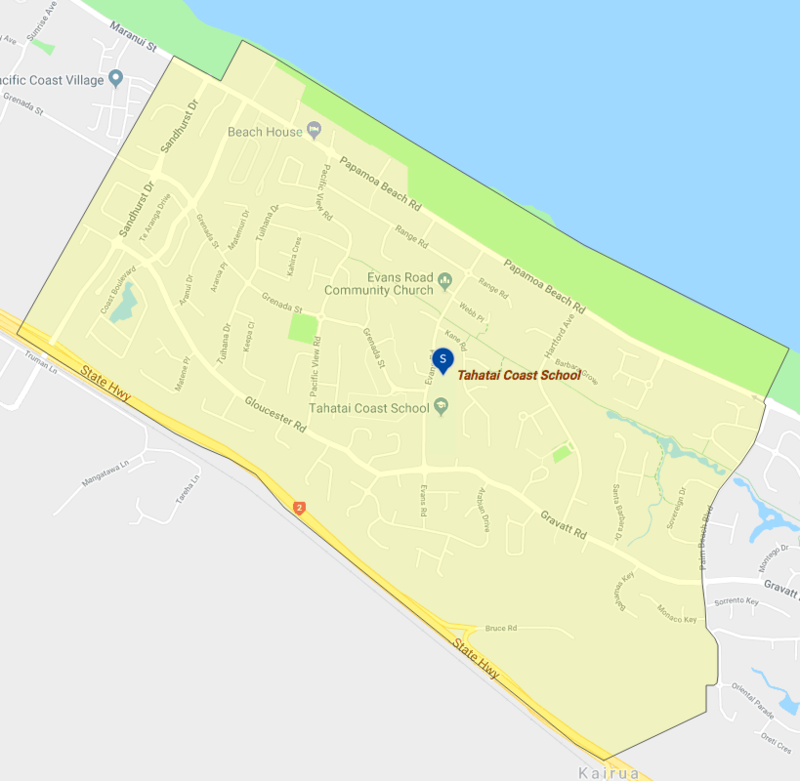 All students who live east of SH2 and within the home zone described below (and shown on the attached map) shall be entitled to enroll at Tahatai Coast School. Including all streets directly accessed from the SH2 Mangatawa interchange, onto Sandhurst Drive through to the shoreline, including Grenada Street up to numbers 320 and 321 and cul-de-sacs Haven Grove, Aspen Place, and all properties to the east. All houses within the extension of a straight line from 142 Palm Beach Boulevard to State Highway 2 meeting with Kairua Road. Proof of residence within the zone may be required. Each year, applications for enrolment in the following year from in-zone students will be sought by a date that will be published in a daily or community newspaper circulating in the area served by the school. The notice will enable the Board to assess the number of places that can be made available to students who live outside the home zone. Each term the Board will determine the number of places that are likely to be available in the following term for the enrolment of students who live outside the home zone. The Board will publish this information by notice in a daily or community newspaper circulating in the area served by the school. The notice will indicate how applications are to be made and will specify a date by which all applications must be received. First Priority This priority is not applicable at this school because the school does not yet run a special programme approved by the Secretary for Education. If there are more applicants in the second, third, fourth and fifth priority groups than there are places available, a selection within the priority group will be by ballot conducted in accordance with instructions issued by the Secretary for Education under Section 11G(1) of the Education Act 1989. Parents will be informed of the date of any ballot by notice in a daily or community newspaper circulating in the area served by the school. Applications seeking second and third priority status may be required to give proof of a sibling relationship.